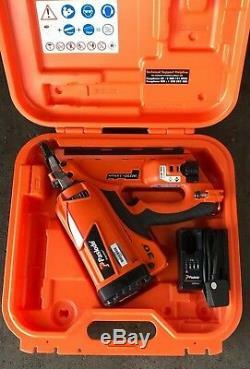 Paslode IM350+ Li-ion First Fix Gas Framing Nailer in good used working order will have general signs of use! Comes with one lithium ion battery with charger in case. The item "Paslode IM350+ Li-ion First Fix Gas Framing Nailer" is in sale since Friday, January 11, 2019. This item is in the category "Business, Office & Industrial\Power Tools\Nail Guns\Nail Guns". The seller is "midnightstrikes2019" and is located in London. This item can be shipped to United Kingdom, Austria, Belgium, Bulgaria, Croatia, Cyprus, Czech republic, Denmark, Estonia, Finland, France, Germany, Greece, Hungary, Ireland, Italy, Latvia, Lithuania, Luxembourg, Malta, Netherlands, Poland, Portugal, Romania, Slovakia, Slovenia, Spain, Sweden, United States, Canada, Japan, New Zealand, China, Israel, Hong Kong, Norway, Indonesia, Malaysia, Mexico, Singapore, South Korea, Switzerland, Taiwan, Thailand, Chile.